I’ve told you to trade everything away at prereleases. Journey into Nyx is making me reconsider that advice. Four times a year, I’ve had a simple mantra: trade everything you open at the prerelease. The reasoning is this: nothing is bulk yet. Everything has a higher value due to scarcity. Buylist prices are never higher, trade values are never greater. Nearly every card from the set will go down in price over the next three months, and it’s rare for a card to have a value higher than its preorder price during its run in Standard. Picking out the cards that will go up requires laser-like focus and a healthy amount of luck. I’ve never been that lucky, and I’ve made consistent gains in value just by trading things away before they’ve had a chance to tank. However, as I’ve covered, things from Journey into Nyx are going to be rarer than cards from Theros and Born of the Gods. That scarcity is part of why I’ll be hesitant to trade some things away after my Prerelease is over, cards that will fall into three categories of hesitation. Most of the mythics I’ll be happy to let go. Flamespeaker Prophet doesn’t actually cast the card, it just does the pseudo-draw that red has gotten lately. Godsend is interesting but not big long-term. The other mythics are not singing to me, and I’m especially eager to move the new Ajani before his price lowers. I will be tempted to hold onto these two Gods, though. The other three are more likely to decline in price. I think that Keranos has a chance in Standard (Especially when paired with Thassa!) and Kruphix’s casual demand will keep the price high for a while. This is a long-term hold, until at least Halloween. 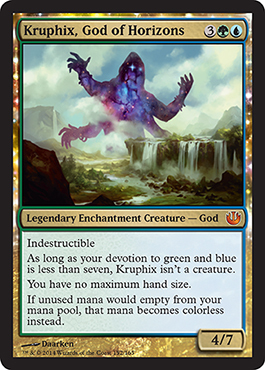 That’s when I see Keranos’s value being highest, and I suspect Kruphix will just steadily increase over time. As a player who is mostly in Commander games, I see a lot of people who like to trade for that which is shiny. I’m one of those people who, when given the chance, will always try to trade for the foil ‘upgrade’ for a deck. With that in mind, I’ll be asking a real premium on foils I open at the prerelease. People who want shiny cards understand that it’s tough to give up those new and shiny cards. Should I crack open a foil God, I’ll be keeping it for the long-term appeal. Eventually, I’ll find someone that’s been dying to have that foil and then I’ll be happy to let it go…for the right price. While there aren’t many Black/Green or Red/Blue decks running around at the moment, the fact remains that these temples will be the hardest to find for the next year and a half. We’ve seen three-color decks use the full twelve Temples because they are just that good! 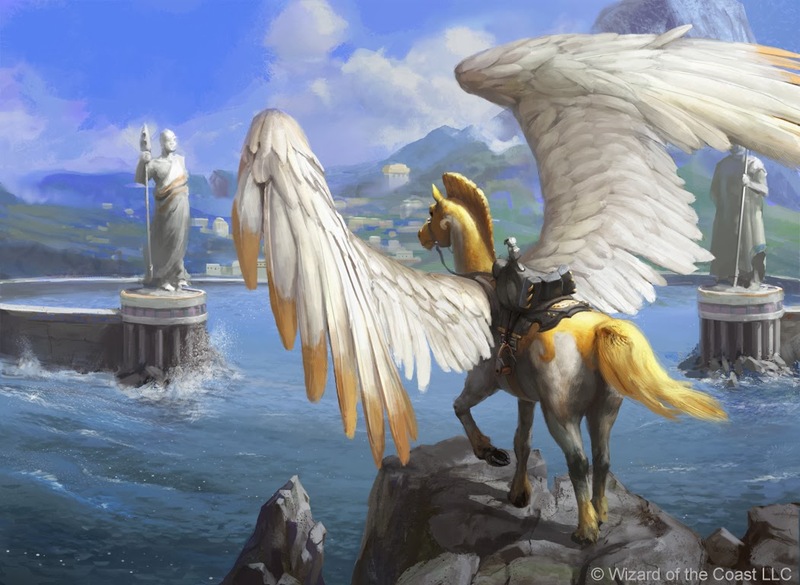 A free scry, even if attached to a enters-play-tapped land, is a powerful effect in any format, though it seems to be too slow for Modern or Legacy. I can vouch for their effectiveness in EDH! Again, to repeat myself: I’m probably going to trade it all away. This is a guess about what I think will go up in value over the long term. I have had good luck with this mindset over the past few years. The scarcity and the power of these cards are making me question a few examples, but I know that even if I trade it all away, I’m possibly giving up some value if I need to get some of these back. Interesting how you and Travis have vastly differing opinions on the God Kruphix. I’m with you. As a casual player, I want that card for my commander deck(s). I think this card has some very interesting long term appeal.